It can’t have escaped your attention after all these years that Minecraft players are capable of building some seriously impressive stuff. We’ve had working computers, vast cities, video game maps remade in incredible detail, and now; Middle Earth. 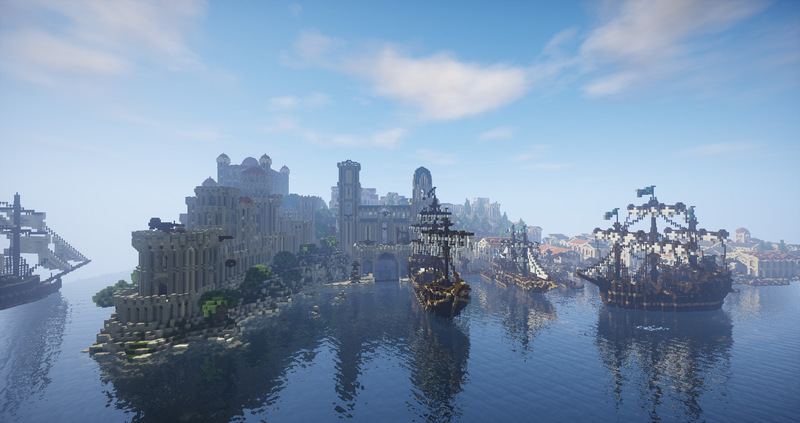 Minecraft Middle Earth is a collaborative project with the goal to perfectly recreate the “lands, towns, and areas” of the fantasy realm from Lord of the Rings. The server is staffed by an experienced group who set up and supervise the construction of various areas, such as Minas Tirith, which you can see below. Everyone can join in with this project by participating in various organised events. All you have to do is live by the rules of the server, and remember that it’s definitely not a role playing server. Running around screaming “meat’s back on the menu” while everyone else tries to get on with building will probably just make everyone hate you. Starter players will have to earn their stripes, mind. If you’re new to the server you will have to prove your worth by starting out on smaller projects (roads, farms, interiors and such). These opportunities will be reliant on jobs being available, but if no jobs are free you can still join in with Themed Builds or play around on Freebuild. Themed Builds are “weekly organized building events” in which the mods promote a certain theme, style or architecture, allowing you to show off your building skills, practice, or learn techniques from other people. You can check out the full FAQ right here if you’re interested in signing up. Otherwise, I’ll just leave you with a selection of gorgeous screenshots from the project below. Minecraft players really can build the most incredible stuff when they come together and work in harmony. There’s a beautiful life lesson in that, don’t you think?